I noticed that the MSD80 files in the INPA/SGDAT and EDIABAS/ECU directories don't appear to be model-specific so I decided to try this software distribution with my E60 535i. I'm happy to say it came right up and I was able to read my injector values. I didn't try to reset any but I have no reason to believe it wouldn't let me do so. Great work, vasillalov! Does this apply to 328 ? tried again and no luck... get the same message sys 00010. Reason: this message comes when an SGBD has an automatic concept switch between multiple diagnostics logs and is not connected to the controller. I can connect, but it won't read any data once i get through the menu options. I'm using Vista, but my other computers are windows 7 64bit. is it vista 32? i actually got that error 100 before. i got a handfull of different error so i'm not clear as to what fixed everything. I just looked at Vasillovs DIY and did you follow it to the tee? If so did you enter the path variable as ;C:\ediabas\bin If you forgot that ; in front of last file it wont work and Ediabas is not connected. Try that out if you missed this. actually, did you make sure you're on map 0 and CAN clear off? does your inpa detect ignition on when you first load it? Yep did everythng above reconfirming all steps. I can connect with ign, battery dark and error showing when it tries to pull data. I'm thinking potentionally the cable, but i'd hate to buy another. Vas and cn you all are both 07s... Do you have direct knowledge of a 08 having success? Okc, what build date are you? Im 10/2007. I thought i saw a later model e60 did this off of Vas's downloads. my build date is 9 06. i did use cn's select files. maybe he's willing to send those files to you too ? Just forward the mail from me to him! Lol. Easy but I have a feeling that's not his issue. Mine is a 2008 model. Build date 10/2007 with CANBUS. Similar issue here And I just put in new injectors. 12/06 build date. Most of other options work. BTW while there I've found an option to lower/raise the idle. Raised mine to 800 to keep that oil flowing in heat. I think you may be using an older version of the MSD80.ipo file. Try the one from my zip. Also, all piggies must be set on full bypass mode. All CAN hijacking must be turned off. I was using your version as well. Procede is disabled but I still think it may interfere. I know it does on N55 even when completely turned off. Will update tomorrow. BTW I have a Bulgarian friend, he sent me a link to music video by Azis. WTF dude? Last edited by onebadmofo; 03-21-2012 at 11:15 PM. It works for me with Procede on map 4 and canclear on using vasillalov's files. And I coded few options as well. Shiv has mentioned several times that the Procede does not intercept anything when the engine is off. Well that's bad then. 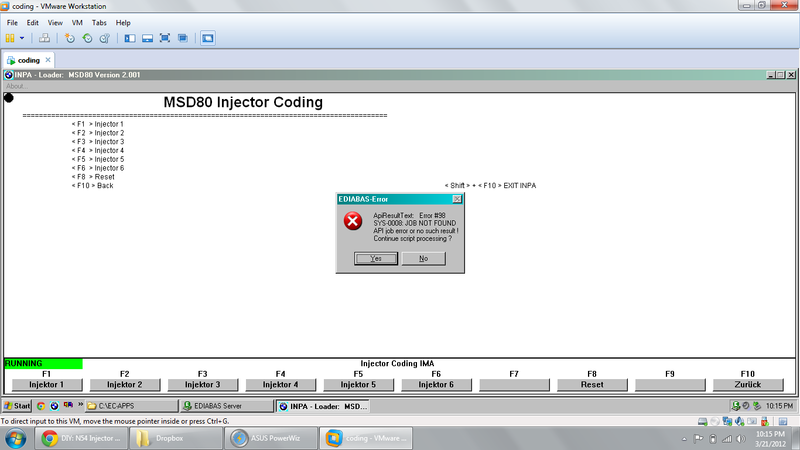 Like I said I already have new injectors installed and now I can't code them. Gonna try with ISTA-D, GT1 or Progman. Come by the meet tonight in Brooklyn..(ceasars bay at 9pm) ..I will have my laptop with INPA working with Dcan cable.. I have an 07 that has never had a software update though...You can use my laptop and even take the INPA program file from me and code your injectors, but I doubt it is the program that you have, since you are far from a novice when it comes to coding...Should take the most 5 minutes if you have all the values copied down for each cylinder....You are the king of coding from what I hear so there is definitely some other issues IMO, but what can it be.. Do you have the latest and greatest update of ECU software. I read somewhere that BMW is coming out with new daten files and INPA 5.06..
Last edited by cn555ic; 03-22-2012 at 10:17 AM. Removed Procede, still no go. MIne is a 2008 model. I've said this 10 times already LOL. My build date is 10/2007 but it is a 2008 model. success... finally. Thanks guys for the advise. Ended up being the order in which cable is connected and turning on the ignition believe it or not. Now we need a new thread in the tech session with DIYs of the different things you can do with INPA... I'm timid to go beyond just looking at each Fx screen.